In running an election-day survey (not an exit poll, which we are not so enthused about), we have decided to attempt something new: we are now aggregating the information via SMS. This gives us the information in real time, and the data will be available for immediate analysis the moment the last SMS has been received. On the image below you see how this looks on our screen. Interviewers send in a code response where letters (A, D, G, and so on) signify the question number, and the numbers are the response chosen. So the letter M, for example, stands for the question "Did you, or anyone from your family, have any problems with the voter’s list? ", and "3" stands for "no". To be sure, this only works with short questionnaires, and has forced some compromises in the answer options, which we have to keep simple. However, it is an interesting step forward. While there are solutions with Personal Digital Assistants, these are expensive and would make our interviewers walk around with expensive, possible distracting gadgets. 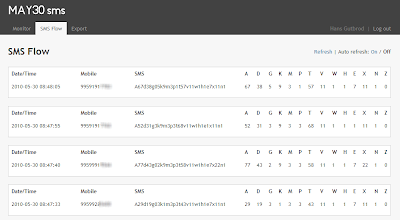 So SMS seems a good alternative for now. Implementing this project ended up being a lot of work: creating a Virtual Private Network connection with the main mobile providers (Magti and Geocell both were helpful), programming the software to disaggregate messages, writing manuals, training interviewers, testing whether it all works, building redudancies so that it becomes a robust system, and creating a system for checking errors. Errors are flagged automatically in red (see below), and we call back interviewers to correct. We are also trying this SMS technology with the election monitors of ISFED, since this offers a rapid way of aggregating their results. At this point this is run as a pilot, to test the technology, and how it is adopted by monitors. Parts of the software have been provided by the National Democratic Institute, and the Open Society Foundation Georgia has generously funded this effort. A lot of effort has been invested by the entire team, but especially by Irakli Naskidashvili, Tbilisi's IT wizard, and Jonne Catshoek, our Crowdsourcing Project Manager. This will all happen today, and we will let you know how it worked, and where we want to take these applications in the future. One of the great things at CRRC is that we have this chance to goof around and try new things.